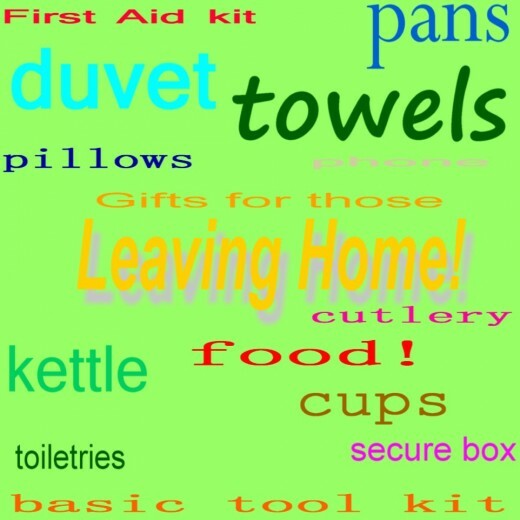 When a young person arrives in their first independent home, one of the initial realisations is just how much stuff they previously took for granted. Open a drawer or a cupboard, and any required item would already be there waiting, ready for use. Not any more. Now they're on their own and about to launch on a steep learning curve. Open the drawer now, and most likely it'll be empty. It's time for them to buy their own stuff. This article aims to help youngsters equip their new home without emptying their bank. Every home should have a good First Aid kit. This might sound like a dull gift idea but it is undeniably a very useful one, and many young people overlook practicalities like this. First Aid saves lives. How about offering to pay for an accredited First Aid course? As well as being practical, this also looks good on a CV. How many previous residents still have keys to the home? There is no way of knowing. Installing new locks is always advisable when moving into any property. If the landlord forbids this for some reason, then at least install bolts, window locks (if they aren't already in place) and a strong door chain. If room-sharing is on the cards, then a strong secure box (lockable) is highly recommended. to keep personal documents, money or valuables safe from itchy fingers. A roommate might be trustworthy - but what about their friends and their friend's friends? A more determined thief would simply walk off with the strong box, but it may be enough to deter the casual opportunist. It's best to keep such things stored out of sight, even so. Insurance might seem a boring subject to someone eager to head off into The Big Wide World, but even if your property is minimal the cost of replacing everything, should disaster or thieves strike, can be high. Shop around for a good deal - and do take the time to read all the small print and be clear on precisely what the insurance covers, and to what monetary limit. Some deals are cheaper simply because they're no so good. If a young person hasn't already learned now to budget properly, then dealing with bills can come as a shock - especially if their parents weren't given to talking about money or the cost of living. Shops are designed to tempt the eye, and the world is full of pretty things which are not actually needed. Vast sums of money are spent on clever advertising to make a person feel they absolutely must have the latest, the newest, the fastest, the trendiest. Recognise the difference between needs and wants. Make a list of practical needs and stick to it. Consider making a gift of a sensible book on basic finance. This might inspire boredom in the rosy-eyed home-leaver but at least the giver will know they tried to instill some sense of responsibility. "Neither a borrower nor a lender be!" If you can't afford to replace it at the same quality, don't borrow it. If you can afford to replace it, buy your own anyway. Gifts for a Home-Leaver's Kitchen! Most students find it vital to travel light. They're going to be moving around between student accommodation and their parental home, or even between colleges, and they 'll have to carry all their worldly goods with them. So unless that student can afford to pay for a removals van each time, it's best to keep possessions to a minimum. Walk into any kitchenware shop and you'll be confronted with a mass of sparkly products. The good news is that you don't need most of them. If you've a huge kitchen and a comfortable income these items may be nice to own, but most young adults starting out in life have neither. Sharing a kitchen means all equipment will have to be stored in your room to ensure it isn't "borrowed." Therefore, it's often best to keep such property to a minimum which can be stashed away in a box or two. An electric kettle, cups, plates, bowls and flatware are basic essentials. Leave the purchase of a large dinner set for another time in your life. You can save a lot of money by buying kitchenware online, or from a market rather than from a department store. Charity shops and car boot sales can turn up bargains, too. One sharp 6" vegetable knife will serve most cutting/peeling/chopping purposes in any kitchen, bu tif you're nervos of using this to peel vegetables then invest in a potato peeler. Probably the most multi-functional pan on earth is the wok. You can use it for boiling, simmering, frying - or even use it as a mixing bowl. Add to this a medium-sized saucepan, and you'll have enough to get by with. You can always purchase other things over time. Pasta, rice and noodles are cheap, easy to transport and incredibly easy to cook. These staples make a practical gift for someone leaving home. Maybe you might make a gift of a week's groceries, or prepare a cardboard box by filling it with basics like beans, soup, nuts and peas in readiness for setting out in your new life. A person cannot live healthily on tinned goods or ready meals alone. Fresh fruit and vegetables, and a protein source (usually eggs, fish and meat) are needed. Some cookery books are aimed specifically at students or other people living on a budget, or who are just learning how to cook for themselves, and something like this would make a practical gift. Another gift idea is a set of herbs and spices - a simple idea but one which can be a great help for a new cook! Cheaper food can often be bought by selecting economy brands rather than the fancier brand names. Look also for a bargain shelf in the supermarket, which offers goods close to the sell-by date or goods whose packaging has been damaged. Shop around and compare prices. The same item in different stores are often priced differently. A few coins saved here and there on each item can have a big impact on the food budget overall. Where is the nearest doctor, walk-in accident centre or hospital? Find them before you need them. Gifts for a Home-Leaver's Living Room! Student accommodation tends to be small and functional. Find out in advance exactly what furniture is provided. If you intend travelling around, keep large purchases to an absolute minimum for the sake of your own convenience. I assume you'll want to sit down at some point. The novelty of sitting on the floor soon wears off. It's cold and rather hard on the derriere, and if you're trying to write or study you'll rapidly get backache. How about a portable fold-away chair? Space - or the lack of it - is often an issue in student accommodation. How about a folding tray-table? You can use it as a dining surface or rest text books on it, and it will be a lot cheaper and more transportable than a proper table. You've all your life before you during which you can purchase better, more elegant things. Meanwhile, aim for what is functional. Browse second-hand stores, craft fairs, car boot sales and jumble sales for bargains. If an interesting piece of furniture is badly scratched, try your hand at "shabby chic." Furniture bought this way can save money but also give a home real individuality and character. A landlord's choice of hard-wearing, (but usually vile), carpet can be disguised with a rug. A few plants and colourful nic-nacs soon make a new place feel more like home. Gifts for a Home-Leaver's Bedroom! Is a bed provided? If so, how old is the mattress and what condition is it in? Consider purchasing a zip-up air-tight mattress bag, such as those sometimes used by asthmatics to contain dust mites and other allergens. A thin memory foam mattress covering not only adds comfort to an older mattress but is much warmer too. Two pillows are usual, but this depends on a person's own choice. Duvet covers often have pillow cases as part of the set. Two duvet covers are the minimum that you'll need - so one can be in use while the other is being laundered. Likewise, two sheets. A fleecy warm blanket is a valuable extra, as being cold is not only miserable but bad for health. This is a serious issue. Feeling cold is not only miserable, it can damage your health and lead to hypothermia. If heating is not included in your room rental, and if you simply can't afford to put the heating on as often as you'd like, then dress for the season with winter-weight jumpers, hiking socks and wear a woollen hat indoors. Wrap a blanket around your shoulders like a shawl. Drape an extra duvet over your couch or chair, and wrap yourself in it. When was your gas fire last serviced? Under UK law, a landlord is obliged to have a properly qualified person attend to this every year, but less scrupulous landlords will try to dodge around this. Use a carbon monoxide detector to protect yourself. Economical & Easy Dinners for New Cooks! Welsh Rarebit is made with leeks, milk, cheese and toast. If you're in a hurry and want something quick, light and tasty, give this recipe a try.